Posted on Sun, Jan 29, 2012 : 5:01 a.m. 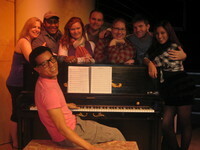 The cast of The Encore's production of "Smokey Joe's Cafe." Seated: Brian E. Buckner. Standing, left to right: Cara Manor, Tony D. Owens, Jr., Thalia Schramm, Steve DeBruyne, Amy Smidebush, Sebastian Gerstner and Fatima Poggi. But smaller doesn’t necessarily mean easier. The popular revue contains almost 40 pop hits of the 1950s, mostly by songwriting super-duo Jerry Lieber and Mike Stoller (“Charlie Brown,” “Searchin,” “Hound Dog,” etc. ), and is dance-heavy. This isn’t Cullen’s first stab at “CafÃ©.” In fact, in a past production, she directed Encore co-founder (and Broadway performer) Dan Cooney. But when approaching a show for a second or third time, does Cullen revisit staging choices that worked before, or does she try to put a completely new spin on it? One thing that sets Encore’s production apart from Cullen’s past experience is its proscenium set-up—previously, she staged “CafÃ©” in-the-round—and her choice to, this time, incorporate steps and different levels into the set, rather than working on a flat stage. Even so, Cullen believes that no matter how the show is staged, audiences tend to have one response in common. Who: Encore Musical Theatre Company. What: In an idealized 1950’s setting, the classic themes of love won, lost and imagined - set to music by Lieber and Stoller - blend with comic set pieces and slice-of-life emotions in this classic revue. Where: Encore Theatre, 3126 Broad St., Suite A in Dexter. When: Thursday at 7 p.m., Friday at 8 p.m., Saturday at 3 and 8 p.m., and Sunday at 3 p.m., February 2-26. How much: 734-268-6200 or http://theencoretheatre.org. “CafÃ©” premiered on Broadway in 1995 and received multiple Tony Award nominations. For Cullen, the show's casting challenge involved finding 8 performers who could not only sing, dance, and act, but also deliver the show’s vocals in a style that’s in keeping with the '50s era. Yet Cullen believes she found the right people. And while she knows some theatergoers shy away from revue-style shows, Cullen said that “Cafe” is “much more than a revue, in that each of the characters has a journey, and it’s about their relationships with each other. It first starts in the neighborhood, where these characters grew up together. They’re definitely not the same age, but in my mind - and what I’ve told the cast is - they all hung out at Smokey Joe’s Cafe, and after 5 years, they meet up and go back in time to when they were younger. Sun, Jan 29, 2012 : 2:52 p.m.
Wow! What a killer cast! Steve, Tony, Thalia, Sebastian - all great performers with wonderful voices and the ability to really sell a song! Plus, some NEW faces!! Can't wait to catch this show! If you're a &quot;Boomer&quot; don't miss it - these are all the songs we grew up with! I don't know about you, but with this cold weather I could sure use an evening of high energy music! !